If you exported a Photoshop layout image from a Harmony project using the Export Layout Image function, you can easily import it back into Harmony, simply be sure to import it at the beginning of the project for accurate scene planning. NOTEHarmony supports both .psd and .psb file formats. In your Harmony project, select File > Import > Images. In the Files section, click Browse to find and select the .psd or .psb layout file on your computer. 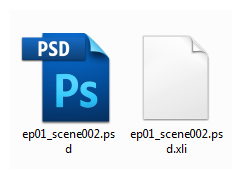 Note that this layout file must have its corresponding .xli file in the same folder. 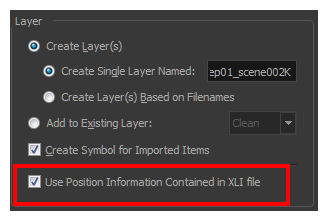 Once you have selected the layout file, the Use Position Information Contained in XLI File option appears in the Layer section. This option is enabled by default. 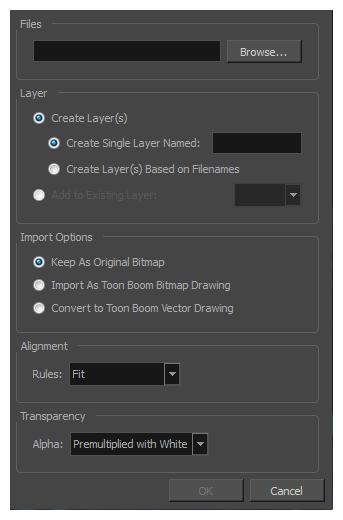 When you import the layout image in your scene, it will be automatically positioned to fit the original layout scene creating an accurate layout guide. 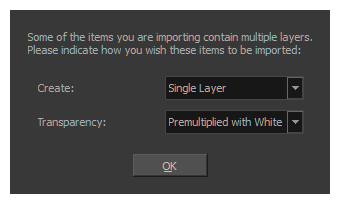 You can disable this option if you want the imported layout image to be imported according to the normal behaviour of the import process. The layout image will be incorrectly aligned as it was when it was first created. From the Transparency menu, select an alpha option—see Import Images Dialog Box. Your image appears as separate layers in the Timeline view, corresponding to the .psd layer group folders Camera_Set and Layout_Set. You can now use this layout as a guide for scene settings. NOTERefer to About Staging to learn more about the scene setup task.